Tetrazzini is one of my all-time favorite comfort foods. This one is quick and easy. I make it gluten free by using gluten-free spaghetti, and replacing the flour for 5 tablespoons of corn starch. Leftovers make a great lunch meal. Preheat the oven to 400 degrees. In a large saucepan melt the butter over medium heat. Add the flour and salt and stir to combine. Cook the butter and flour mixture for 1 to 2 minutes. Gradually whisk in the chicken broth to the butter mixture. Stirring constantly, gradually bring the mixture up to a boil, turn down the heat, and then simmer for an addition 2 minutes until the mixture thickens. Remove from the heat and stir in the milk and Parmesan until the cheese melts. When the noodles are done cooking, put the frozen broccoli in the bottom of the colander before you drain the water. Pour the hot water and noodles over the top of the broccoli and stir to combine. Spread the cooked spaghetti and broccoli mixture in the bottom of a greased 9 by 13-inch baking dish and then pour half of the sauce over it. Top with the chicken or turkey pieces and then drizzle the remaining sauce over the top. Top with mozzarella. Cover and bake until hot and bubbly, about 25 minutes. Remove the foil and bake for an additional 5 minutes until the cheese is slightly browned. 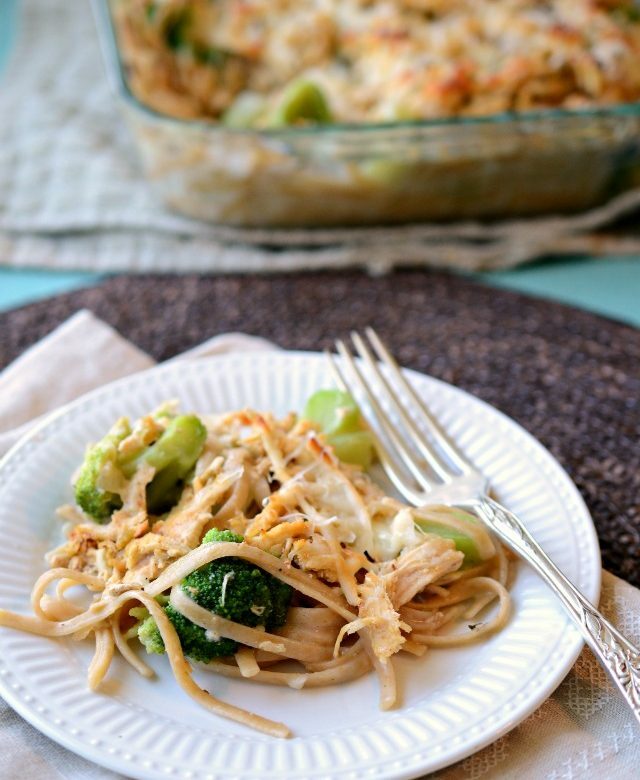 Let the tetrazzini cool in the pan for 10 minutes before serving.